I will admit right here that my first attempt at grafting was a complete failure. Only one of twelve grafts survived and grew. It was almost enough to make me give up. What kept me trying was a couple of chance natural grafts that live on one of my plant benches. If these two could be secure grafts without any help from anyone, then surely I could get two pieces of adenium to grow together. My second attempt went somewhat better with nine of twelve succeeding. This will be my third try. That old saying about reading the directions came to mind and sent me off to YouTube to see what others were doing. One thing that became apparent immediately was that every successful graft started with a scion that had all the leaves removed. The completed grafted plant did not have a single leaf. This is what I had been doing wrong. I like leaves on my plants, so I had been leaving a few at the top of the scion. Wrong...take them all off. Step one: Assemble all the tools and supplies you will need. 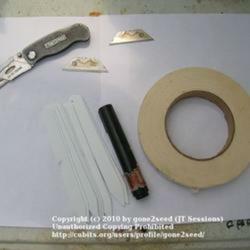 The ones I use are a sharp knife or razor blade, grafting tape (adhesive tape will work in a pinch) and some means of enclosing the completed graft. The tape does need to be strong enough to keep the open cut closed. The big operators use small plastic bags. Since I only needed a few, I used cut off plastic bottles. 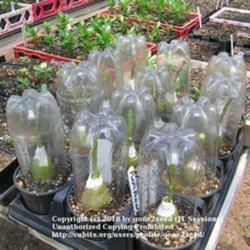 You want to keep the new grafts under very high humidity until the graft is healed. 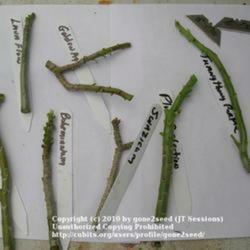 Step two: Select a young, healthy rootstock with a stem just larger than the scion you will be using. This is not critical. The stem may be larger in diameter than the scion but should never be smaller. Step three: Select some good scions from your parent stock. I used pieces about three inches long and containing several good nodes. These nodes will later produce the new branches. This is a good way to increase your stock of named varieties, but keep in mind that grafting can also be used to correct a tall spindly plant. Cut out a long section and graft the top onto its own rootstock. 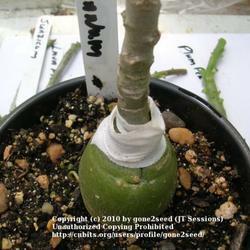 Now, with everything ready, cut off the top of the rootstock at a point that closely matches the scion you will use. Make a v-shaped cut in the rootstock. I used a cut about one inch deep. Now make a matching cut on the scion. I like to cut the point on the scion slightly shorter than the depth of the cut in the rootstock. For example, if the cut in the rootstock is one inch deep, make the point on the scion about 7/8ths inch. You don't want bare scion exposed above the cut in the rootstock. Be sure the cut is on the bottom of the scion as it's easy to cut the point on the wrong end. You don't need to ask me how I know that. Place the scion securely in the center of the rootstock cut. This would be a good place to mention the difference between grafting adeniums and grafting other things such as fruit trees. When grafting fruit trees, you must match the cambium layers on scion and stock. With adeniums this isn't necessary, you just insert the scion and tape the two pieces securely together. Cover the grafted plant with something to keep humidity high and place the graft in a place where it won't be bumped until the graft heals. The hardest part comes now, leaving the grafted plants alone until they heal. 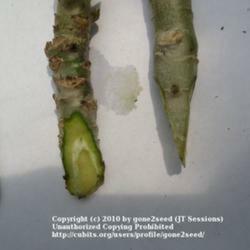 In the following picture the plant on the left has a graft that is six weeks old. This one is healed and growing. The voids will fill in as the plant continues to grow and heal. The graft on the plant on the right is over a year old and well healed over. I need to mention one other thing I have noticed about grafted plants. Grafted plants don't seem to grow as fast as seedlings. 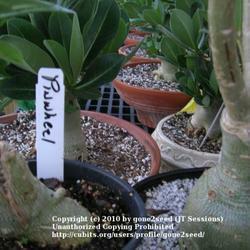 The seedlings grow at almost twice the rate of their grafted cousins. Try a graft or two. It's easy and fun.